By a river at the foot of wooded hills in the Scottish Lowlands, yaks imported from Tibet graze idly in fields near steps that lead to a temple topped with a golden pagoda. ESKDALEMUIR, Scotland -- Summoning monks and nuns to morning meditation, heavy gongs echo through a sprawling compound where two giant golden Buddhas, one with a cobra coiled above its head, stand by a fountain and gardens. 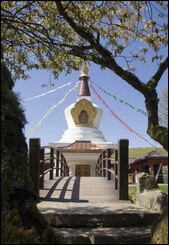 Welcome to Samye Ling, Europe's first and biggest Buddhist monastery. A picture of bucolic tranquility several miles outside the village of Eskdalemuir in southern Scotland, the monastery is celebrating 40 years in which it has not only survived but thrived in an alien setting. Increasingly open to westerners, the monastery has also established centres in more than 20 countries, including Belgium, Ireland, Poland, South Africa, Spain and Switzerland. (GAD}The monks and nuns, their heads shaved and wearing orange or burgundy robes, hurry up the small steps that lead them to the temple -- the first built in the West. But there are not just monks. Doctors, artists, students, therapists and the occasional celebrity also turn up at the temple, built in the 1980s along Tibetan specifications. It stands two stories high, with a roof in the form of a pagoda, while at the altar inside, stands a Buddha, immense and golden. "Don't let all the gold blind you when you enter the temple. Did you take your sunglasses?" former monk Josep Soller, a Spaniard, told a visitor. Soller told AFP he was a Buddhist monk for 12 years but has remained at the monastery where he now works in the kitchen. He has been here 20 years. During this period, he shut himself off completely from the outside world for several years, living in silence among fellow monks in a secluded building at the monastery. "You enter the retreat, the door closes behind you and you cannot hear another voice, nor know anything about what is happening in the world," Soller said. "After this, you know yourself very well." In the breakfast room before meditation, the monastery's abbott Lama Yeshe, who holds the honorific title Rinpoche, said his brother Akong Rinpoche and another monk Chogyam Trungpa Rinpoche founded the monastery here in 1967. The two men, who were part of a group that had fled Chinese-occupied Tibet in 1959, eventually ended up in Scotland and headed to a hunting lodge here called Johnstone House where another Buddhist monk lived. 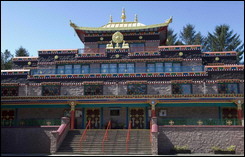 The original monk emigrated to Canada, but Akong and Chogyam stayed on at the lodge to found a community which they named Samye Ling after a temple in Tibet. In the following years, the place became a pilgrimage site, attracting "hippies", artists and musicians like Leonard Cohen. "People from around here told me that in the sixties they would see sometimes John Lennon and Yoko Ono walking around," said Joanna Mackintosh, who lives in a nearby village and was visiting the Tibetan tea room, which is open to the public. But nobody in the monastery remembers Lennon here. "Maybe he was here, I don't know", said a nun at Samyre Ling, Ani Rinchen Khandro. The abbot's story is also the stuff of legend. When he came to Britain, he was 18 years old, and he lived the experiences of any young Westerner: he would ride a motorcycle and listen to the music of Jimi Hendrix, indulging in drink and drugs. "He had kind of a wild time, but then he decided to turn a new leaf", said Ani Rinchen Khandro. He was ordained in 1980, and went into long solitary retreats. In the 1990s, he became abbot while his brother Akong spent six months a year in Scotland and the other six in Tibet. "He has about 150 projects in Tibet, including the charity Rokpa", explained Ani Rinchen Kandro. The Dalai Lama, the exiled leader of Tibet, has visited Samye Ling on two occasions, in the 1970s and 1980s, said the nun. Today Lama Yeshe can be seen every day, leading meditation, teaching Buddhist classes or strolling among the Buddhas, fountains, residences or through a room with hundreds of candles lit to plead for world peace. Near him a nun, Ani Lhamo, said Lama Yeshe, now 64, had decided to travel back to Tibet. "We worry because of his health, Tibet is very high," she said. 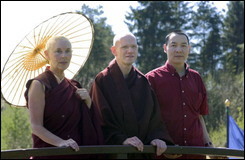 But Lama Yeshe only smiled. "He always does what he wants," Josep said. In 1991, he even raised the money needed to buy an island off the coast of Scotland, Holy Island, that holds retreats and offers courses in meditation, yoga, vegetarian cooking. Meanwhile, in the little tea room, visitors and monks shared a quiet time. One of the visitors, Judith, had come to take a course in meditation. Eric and Lucie were on a Tai Chi retreat and Anne was there to take a course in thangkas, Tibetan painting. The temple is adorned with magnificent thangkas by the great Tibetan artist Sherab Palden Beru, who lives in the monastery. "They are masterpieces, like the Mona Lisa", said Ani Rinchen Kandro. After four decades the monastery has become a part of the stunning lowland scenery. "Before, the neighbours had a lot of distrust.. but it has changed. 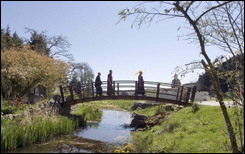 They accept Samye Ling... now it's peaceful coexistence," said Mackintosh. "The only dispute that I know about happened when some of the yaks went into the fields of one of the neighbours," said Soller. "But that was a dispute between neighbours, it had nothing to do with religion or distrust towards the monks."